Fides et Ratio. Faith and Reason. This is Ave Maria School of Law’s motto. Ave Maria School of Law is Southwest Florida's law school offering a high-quality legal education with a commitment to professional excellence, rooted in the Catholic intellectual tradition. With a campus located in Naples, Southwest Florida’s paradise, and small class sizes, students have the advantage of one-on-one time with their professors. At the root of where it all began is Ave Maria Law’s inimitable founder, American entrepreneur, U.S. Veteran and devoted Catholic, Tom Monaghan. Ave Maria Law is proud to be named “Most Conservative” and “Most Devout” law school by PreLaw magazine, one of the best law schools by The Princeton Review, and ranked, more than once, a top military-friendly school by VIQTORY. Ave Maria Law is committed to honoring our nation’s military veterans. Ave Maria Law is proud of our students and alumni who are veterans, as well as three retired Army JAG officers on our faculty including our President and Dean, our Founder, Thomas Monaghan, a Marine Veteran, and several members of the Board of Governors who are also veterans. What makes us stand out on campus: Yellow Ribbon Program participation and generous scholarships; Student Veterans of America Chapter on campus; Veterans Resource Center in the Veterans Memorial Law Library, providing resources for veterans to research veteran rights and benefits. Unique for a law school, there is on-campus available for students and their families. Ave Maria Law prides itself on being a family-friendly environment. The law school lies contiguous to an elementary school. Ave Maria Law hosts an annual event honoring veterans, bringing the local community of veterans and their families together. The law school created a program, “Veteran Legacies at Ave Law,” where friends and families of veterans can tell their story as part of a video interview, honoring the veterans in their lives. Licensed by the Florida Commission for Independent Education, license number 4007. Fully accredited by the American Bar Association. 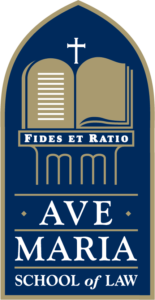 The curriculum of Ave Maria School of Law includes a Research, Writing and Advocacy Program as well as several required courses that focus on law and ethics. Other courses include Civil Procedure, Criminal Law, Constitutional Law and Jurisprudence. The school also offers an Advantage Summer Start program. Take advantage of Ave Maria School of Law's commitment to your service. Request info now on how you can enroll!